Graham Ley taught drama in the Universities of London and Auckland as well as Exeter, and has directed and translated for the theatre. His particular interests lie in comparative performance theory, dramaturgy, performance in the ancient Greek theatre, and British Asian theatre. He held a Leverhulme Fellowship in 2000-2001, and was the award-holder for an AHRC-funded research project on the history of British Asian Theatre, active from October 2004 to March 2009 (and see Publications). 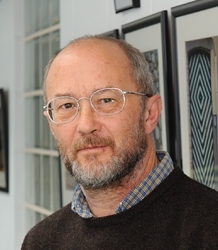 He is an editor of the series Performance Studies for the University of Exeter Press, and joint editor with Dr Jane Milling of Theatre and Performance Studies for Palgrave. In July 2010 he was invited to give a keynote on British Asian Theatre at the conference Theater und Migration at the Comedia Theatre in Cologne. In January 2013 he was invited to contribute to one of a series of causeries at the Witte de With Centre for Contemporary Art in Rotterdam, as part of the activity surrounding the preparation of Alexandre Singh's work, The Humans. In September 2014 he was asked to compile the timeline on the history of British Asian theatre production in London for the programme of the London revival of East Is East, at the Trafalgar Studios which opened in October. Massinger's The Roman Actor (Exeter, 1998). Dramaturg to John Barton on Tantalus, directed by Peter Hall in Denver USA, in 2000 and the UK in 2001. Exploratory workshops of translations of tragedies by Sophocles in 1998-99, published by Everyman. Advisor to the Royal Shakespeare Company, Euripides' Ion, 1994. Script translation and adaptation from ancient Greek, Italian, French and German. Dramaturgy has no fixed expertise, but it calls upon the skills involved in the preparation of material for performance. As an activity, it may be exercised by a group in devising a performance, or by specific individuals, within a production setting, whether egalitarian or hierarchical. Research is an essential component, and so is a sense of the language or means of performance, and of the structure or technical modalities of the production. Dramaturgy is also an art of revisiting and reconstituting, notably when the material has already had an existence as a theatrical or performance text, and is being reproduced. In such circumstances, it is more likely that dramaturgy will be exercised by individuals, who will not necessarily be named as dramaturgs. In the British theatre there is no substantial history for the dramaturg, whose activities have traditionally been allocated to figures such as the literary manager, the research assistant, the script-reader, and the assistant director. Much of this practice historically derived from the role and power of the actor-manager (often a formidable dramaturg) as well as the literary tastes of nineteenth- and early twentieth-century commercial theatre and the rise of the director. European and to some extent American dramaturgical practice have changed this legacy, particularly in subsidised theatre since the Second World War. Even now, however, some of those known as dramaturgs may be confined to the reading of scripts, largely for rejection, or to the kind of research that a director often ignores, but which may find a home in the programme notes. It follows from this that any dramaturg in the British theatre will have a particular history, rather heavily defined (or confined) by the profession. Those who have worked as dramaturgs (and literary managers, as many UK companies still define them) in the last ten years are fortunately able to show a far more diverse and attractive profile. My own activity has been of a specialist kind, exercising a particular expertise over a long period, with consultation of that expertise by professional engagement, an intermittent but prominent feature. One of the characteristics of my work is common to many European dramaturgs and to some British writers and dramaturgs, and that is cultural translation. By that term I mean the application of language skills not only to the translation of existing scripts, but also the exercise of adaptation. In my case, this has been notably but not exclusively from ancient Greek. Adaptation is perhaps the least acknowledged of all aspects of theatrical creation. It should be, but is not, a common perception that many of the major periods of theatrical vitality across many cultures have been constituted by the adaptation of materials. This is as true for ancient Greek tragedy (adapted from narrative recitation) as it is for Sanskrit theatre (adapted from the narratives of the Mahabharata and Ramayana), for Japanese noh theatre (adapted from the earlier clan sagas), and for Shakespeare (adapted from a variety of narrative sources). Many contemporary scripts also have their origin in a narrative source, and audiences often highly favour adaptations of novels, in a variety of forms: the musicals Les Misérables (Hugo) and Nicholas Nickleby (Dickens), and Wertenbakers’s Our Country’s Good (from Thomas Keneally’s novel, The Playmaker) are obvious examples. The second category of adaptation is even more intriguing, and that is the adaptation of existing theatrical scripts, the remaking of a play. This is as old as Greek tragedy, and as prestigious as Shakespeare’s Hamlet (remade from a play by Thomas Kyd), and is favoured by such contemporary playwrights as Sarah Kane (Phaedra’s Love, adapted from Euripides’ Hippolytus and Seneca’s Phaedra) and Mark Ravenhill (Totally over You, adapted from Molière’s Les précieuses ridicules). It is probably true, in general terms, that adaptation forms a substantial part of what is encompassed in dramaturgy, and has always done so, as it is also true that any active script-maker is also a dramaturg. My most significant role in dramaturgy was undoubtedly in support of John Barton, the author of Tantalus, for whom I acted as research advisor over a ten year period from 1990 - 2000. Tantalus was finally produced in Denver, Colorado in 2000, and toured in the United Kingdom in 2001. It was directed by Sir Peter Hall, in a version of Barton’s script realised by Colin Teevan. I commented in some detail on my role in a talk given at Denver on the occasion of the first production. Barton’s full script is published by Oberon. I have also attached here examples of my dramaturgical script-work. There are adaptations (for sound) of Euripides’ Medea, with excerpts from Filthy Frogs for live performance, adapted from the comedy by Aristophanes. I was invited by Anthony Vivis, then head of the Script Unit at BBC Radio, to prepare a version of Euripides’ Medea. But by the time I had completed it, Vivis had left and the script failed to find favour. I chose to transpose Medea into a role for a black woman actor and to produce a version that worked with simple but forceful rhythms and cadences. These were integrated with a sound text that was at times a gentle satire on the effects used in radio drama. Filthy Frogs formed part of a quest to relate the perceptions of Aristophanes to the contemporary in theatre.